There are different options when it comes to start and finish your blue cruise. As we mentioned before, we have 4 main destinations where you can start and finish; Bodrum, Marmaris, Fethiye, and Gocek. For Greece, the most convenient is Rhodes and Kos because they are close to Turkey ( Marmaris and Bodrum) but in a matter of fact, it does not really matter where you start or finish because although all of them have a different character, they share the same special charming and heartwarming appearance. There are four main ports from where travelers have choices for boat charters in Mediterranean Turkey. These Turkish boats known as gullets, can be chartered from Bodrum (Aegean sea), Marmaris (borderline Aegean/Med), Gocek and Fethiye (Mediterranean). The Dalaman airport serves the harbors of Marmaris, Gocek and Fethiye. Milas airport serves the Bodrum harbor. As for how many boats are in each port, we cannot say. For base ports and selection, Bodrum offers the largest choice, followed by Marmaris, then Fethiye and finally Gocek. But that is not to say that a gulet charter in Bodrum cannot embark from Marmaris; or a gulet located in Gocek cannot begin the charter in Fethiye. While these gulet boat charters are based at any one of these ports, where they are available from is based on the current booking schedule. If there are no bookings; then there are two things that can happen. Either the gulet can accommodate the client from the port that is convenient for them, or charge an empty run fee to make sure the boat is where the client prefers it to be. For some travelers, embarking from Gocek, Fethiye or Marmaris does not make a difference since these three ports are served by the same airport. A similar theory applies for guests wishing to board from the Greek Islands; Rhodes or Kos. Rhodes is more convenient for boat owners in Marmaris as it is the closest major port. Kos is closest to Bodrum. Depending on the time of year, booking schedules and the boat owner’s terms, where guests wish to start their journey when a boat they charter is located in a different port – can be flexible. For ideas, here are a few favorite multi-family gulet charters in Turkey from the 3 main regions; namely Bodrum, Marmaris and Gocek / Fethiye to consider. It’s not often that a deluxe class gulet launches in this region, but in 2014 it is. 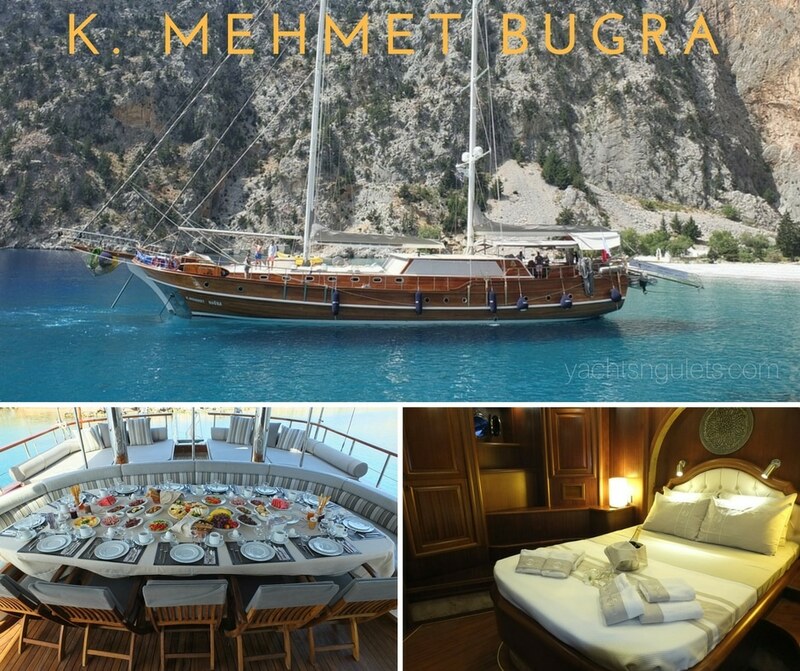 Excitedly we present the grand size Turkish yacht, the 34 meter Deluxe Kaptan Mehmet Bugra. This Marmaris yacht charter is going to be let into the water by the second week of April 2014. Other than her graceful appearance, top quality construction and materials, highly experienced crew – the Kaptan Mehmet Bugra gulet is one of the few yachts insured to carry 16 passengers in Greek waters. The standard max. is 12. However multi-family groups will be able to benefit from this and choose to cruise only the Greek Islands or combine the destinations in both countries. There are 4 double cabins, 2 master cabins, and 2 double cabins with extra single beds (triples). Boasting a wide beam of 8.4 meters there is more room on board to enjoy then ever! She has had fantastic early bookings before completion and is expected to be one of the most popular large group gulets in 2015. Bodrum is the origin of gulets and blue cruises. As such there is more selection from this seaside city than anywhere else in Southern Turkey. Among the numerous favorite Bodrum yacht charters (and it was a very tough decision to just pick one for this blog), here is a gulet to capture your heart and take you away on a stunning cruise into the deep blue waters of the Med. Built in 2010, so fairly new, the superb Ilknur Sultan gulet offers her guests 6 beautifully designed cabins, high quality all the way – at very reasonable charter rates. So many gulets and destinations. Which one will it be? and what places will she take you to?